Hello swappers! 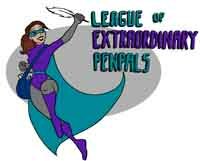 I recently launched a superhero-themed penpal club called The League of Extraordinary Penpals (LEP), which I co-created with my penpal Julie! In honour of this exciting occasion, I thought it would be appropriate to create a superhero-themed postcard swap. This swap is perfect for people who love mail, postcards, and/or superheroes. The details are pretty simple: you will have TWO partners and you need to send ONE superhero-related postcard to EACH partner. An example of a superhero-related postcard would be a Marvel or DC comics postcard. However, the definition of "superhero" is fairly loose for the sake of this swap so feel free to send a postcard featuring someone or something that wouldn't be considered traditionally a superhero (ie: from a comic book), but highlights someone that you personally think is super heroic. For example, perhaps you think Hans Solo should be considered a superhero--write a message to your partner explaining why you think so. I encourage you to write a message to your partner(s) telling him/her who your favourite superhero is and why. LEP encourages its members to come up with their own penpal superhero powers, so perhaps you could also tell your partner about what superhero power you'd love to have and why. No ad cards, but both commercially printed postcards and handmade postcards are welcome. Newbies are also welcome but only those with filled-out profiles. Now up, up and away with the swap! Looking forward to it! My DC postcards have been itching for use!! Hope you do another one of these! whoops! Didn't know I had to mark send... LOL My postcards have gone out! I only wish I had like ten swap partners instead of two... for some reason I really like the constriction of such a small amount of writing space! It makes you choose your hellos wisely!